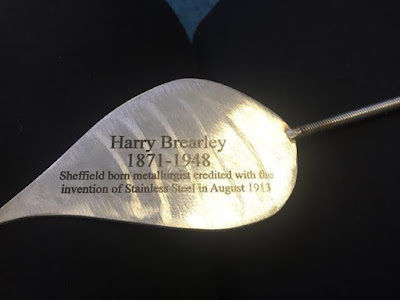 The name of Harry Brearley, the Sheffield metallurgist who invented stainless steel, has been etched onto a unique sculpture at Rotherham Hospice. The Tree of Life - an imposing, unique sculpture in stainless steel created by Yorkshire Man of Steel designer Steve Mehdi - is inspired by the shape of a tree in the hospice garden and intended as a commemorative artwork. The three metre tall structure will support over 290 individual leaves which can be dedicated in memory of a loved one. The unique fundraising venture has already raised some £35,000; numerous bereaved relatives whose loved ones received hospice care have paid for engraved leaves and sections of bark to be placed on the tree in their memory. Nestled on high, next to that of his grandson and his great-nephew, is the name of Harry Brearley, the Sheffielder who researched the addition of chromium to steel to create an alloy he called "rustless steel" in 1913. The leaf was bought in his memory by Ann Humberstone, the wife of Harry's great-nephew Peter, a patient at Rotherham Hospice who died in November 2015 aged 85. Ann, of Wickersley, had decided to buy a Tree Of Life leaf in memory of Peter and thought that Harry, and Peter's distant cousin Basil Brearley, deserved a place up there too. Said Ann: "Basil was the grandson of Harry Brearley. The family was extremely proud of its famous relative. 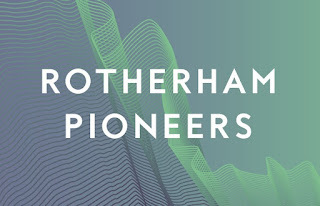 Peter attended Sheffield celebrations for the centenary of Harry's invention and donated the first set of stainless steel knives ever to be made, a family gift from Harry himself, to Kelham Island Museum so they could be shared with the city." Ann added: "I wanted to give back to the hospice for the care Peter received from its occupational health and Hospice At Home care teams in the two weeks before he died. They became our comfort blanket and helped me to deal with the desperate time leading up to Peter's passing. "I decided to have a steel leaf engraved in Peter's memory, then thought it would be a lovely idea to have the names of Harry and Basil up there too. The hospice is a very caring place and I think the inventor of stainless steel would be very proud to have his name on the tree, which exists because of his invention." Peter Bradley, director of fundraising and marketing at Rotherham Hospice, added: "This was a wonderful gesture from Ann. We are very proud of every name on our stainless steel tree but to also see it bear the name of the man who invented the metal over 100 years ago is really something."